It seems like yesterday, but it was actually two years ago when educator-now-consultant, David Jakes, led our district level workshop about designing meaningful spaces for the modern learner. After considering school climate and culture, Mr. Jakes's driving questions were, "What types of learning experiences do you want for your students? Can you design spaces that serve as invitations to inquiry and learning?" Those early conversations sparked discussions with faculty and staff, with students and their parents, and with members of our communities. In our high schools, the fruits of those conversations are becoming realities. "Make it new - look at your space with 21st-century eyes: Does it work for what we know about learning today, or just for what we knew about learning in the past?" 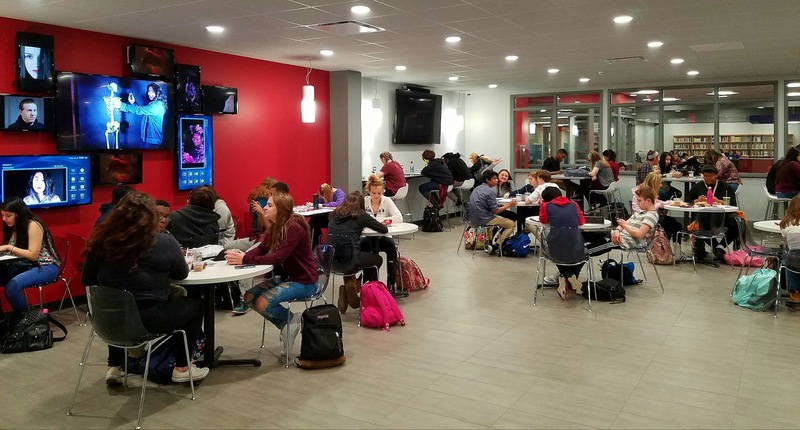 Nearly a year after breaking ground, our remodeled media center opened today to the "oohs and aahs" from our students and staff. Bright colors, comfortable seating and flexible spaces invite interaction, collaboration, tinkering, and quiet reading. My new office is located in our media center, thankfully, it is also a brand new space inviting collaborative work. Still a work in progress, I've added a few touches to make my office space more inviting and interactive. I have a mini-fridge stocked with bottled water and fresh fruit. The candy dish is out and is always filled with treats. Nothing says, "let's sit and chat" quite as well as chocolate. When I don't need razor-sharp focus, I like to listen to music. I have a Bluetooth speaker tuned to my favorite playlists; yes, I take requests. I keep puzzles and handheld games out so passers-by will stop to try the Rubik's Cube, or Ozobot. The lava lamp, well, just because it makes a cool red glow. These additions may seem insignificant, but I've found that touches like these make my office an inviting place to hang out. Since my current job doesn't allow me to get into classrooms with daily regularity, I consider my office like a third place, a space that influences school climate and helps build learning relationships. I appreciate that my district has the skilled manpower and financial resources to support the creation of innovative learning spaces. I'm glad our leadership teams sought input from the variety of groups who will be using this beautiful place. I'm proud to have been a part of the planning and design of this amazing project. 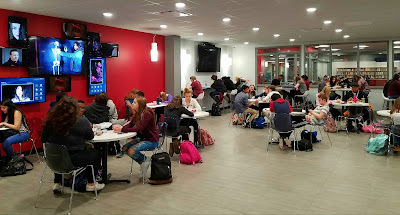 The results speak for themselves, our new media center is the talk of the town and will quickly become a favorite assemblage of learning spaces for our students. Well done Bob on the new space. I really respect that you recognise the leadership involved in making it possible for the opportunity to occur. I would sit in that office with you and eat some candy at ease! I love the idea of a "third place." Thank you also for your first post in this #Edublogs challenge which introduced me to the challenge - I am delighted with prompts like this weeks! I like the idea of the candy dish in the office space and you must have considerably more control than me? My work colleague had a Candy Jar on her desk (next to me) that she continually replenished. Drove me crazy :( (no self control). And you are probably saying -- Sue I raised so many important things and you got distracted by the Candy! See what I mean? Wow what a great space! I love the mini-fridge and fruit idea, also love that you take requests from students. I love to play music too, maybe that is an addition I need to make to my classroom!